A programme on the beeb yesterday dealing with Britain’s economy, entitled What’s Britain Worth? and hosted by Peter Snow and his son, featured a short interview with one of the nation’s wealthiest men, Felix Dennis. Aside from the rather astute observation he made about the wealthiest members of society (“They’re all shits!”), Dennis talked about the creation of his legacy, the self-named “Forest of Dennis”. Dennis’ plan is to create a 25-30,000 acre broadleaf forest in the British Midlands. Buying up land, often under aliases, he estimates the project to cost in the region of £200-300 million of his private estate, plus an equal amount in donations over a period of years through a charitable foundation. Said to be the largest forest plantation in 500 years, as Dennis stated his reason for going ahead with this project beyond the simple ego-trip, is that in his happy financial position he is able to put capital behind an initiative like this which neither private finance nor government is prepared to do, and yet his gift to the community is something many can appreciate and all will benefit from 1If we take as gospel some basic assumptions about carbon trapping in reforestation, and the effects of CO2 on the climate. Whether the planting of forests can be seen as sustainable (it is only the outsourcing of agriculture which allows such reforestation initiatives) is yet to be seen. As one of those “shits” of the upper echelons then, it might well be regarded that Dennis’ project is the result of an ego-trip from a man with no offspring or family to leave his millions to. Some cynics might even suggest it is an attempt to atone for his previous excesses of drugs, alcohol and women. And both might be true. But in the end this wayward form of philanthropy can do little harm and might do a fair bit of good. 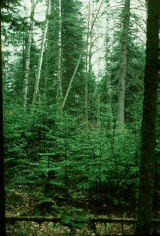 As for the forest’s name, as Dennis himself says, the forest will be known by what the people who walk there call it. Or perhaps it will stick, like an early 21st century Saltaire?